When Peter, Dennis, and Neil came into the Tank, we all fell in love with their brand image. From the packaging design to their company name, they did everything right. My favourite part was definitely their product – they’ve taken a classic favourite snack that’s already pretty healthy and made it better. What’s more is that they knew their market right from the start and by getting endorsements from all the right people, they were able to establish their brand loyalty. Of course it helps that their products are so delicious! 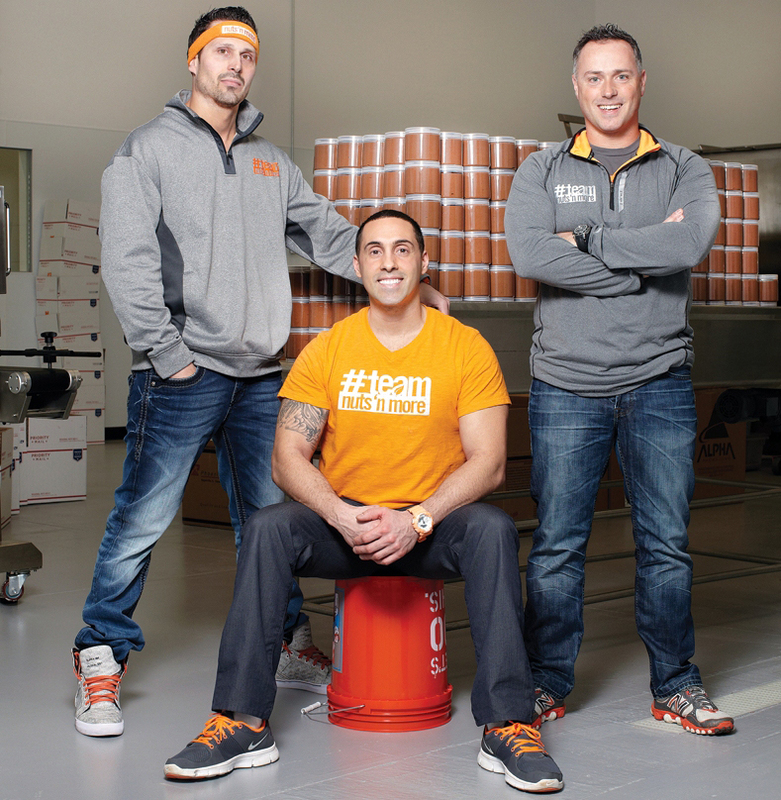 Peter, Dennis, and Neil are so focused and passionate about their company, so after sitting down with Peter for the Nuts ‘N More Create Your Success Story, I had no doubts that they’ll continue to see incredible growth and success! Having parents that immigrated from Europe over 40 years ago, seeking a better life for my family is my biggest motivator. My parents groomed me at a very early age with the notion that hard work and surrounding myself with the right people will allow me to live out my dreams. They instilled in me that absolutely anything is possible. So how did Nuts ‘N More start? I started it because I realized there was a need – simple as that! Everyone loves peanut butter but I knew there weren’t a lot of delicious options for people who are more health-conscious, who want nutrient-rich spreads. There were a few spreads but they weren’t necessarily the best tasting. So Dennis and I got to talking and realized that this is a need we can fill. With my parents’ bakery shop, we were able to have a space where we could try new recipes and formulas and we’ve never looked back! Let’s talk about Shark Tank – what are the top three lessons you took away from the experience? Becoming a business owner is like being married. If you can’t commit, this isn’t for you. Know what you know, but more importantly, know what you don’t know. Solid commitment is a must for any successful business! How did you know that this is what you wanted to do? When the Shark Tank producers called me about making an audition video, I knew right then and there that I was being given an opportunity to turn my (serious) hobby into a career. I left my job before we even filmed the initial Shark Tank episode in LA, that’s how real I knew this was and how I knew this was want I wanted to do. That’s amazing, Peter! Tell me about what success means to you. I have a few key success metrics. As acting COO, I’m constantly measuring every aspect of the business to ensure we are growing. Nuts ‘N More is essentially like a “baby” and my job as its “parent” is to make sure its growing to be big and strong. Luckily my Shark Tank investors have provided me with vital insight and tools that allowed Nuts ‘N More to continue its climb up the success ladder. I believe that as long as I’m creating viable products and making a difference in my industry, I feel fulfilled. At this phase in my life, I’m fortunate to be creating meaningful foods for the health conscious consumer. Several years ago, I was yearning for products such as the Nuts ‘N More spreads and they simply did not exist! Maybe I’ll be creating similar foods enriched with new vital nutrients or antibiotics for the less fortunate in far parts of the world in 15 years! Who knows, anything is possible! As long as I’m contributing in some way, the feeling of success and fulfillment won’t be far behind. I’m big on keeping fit so I love that I can indulge myself on your spreads while staying healthy! Did you find there’s a price for your success and if so, what was yours? The most obvious price of being a successful entrepreneur is time. While most of my friends and family are working 40-hour work weeks pumped for the weekend, I’m sitting here with this internal force that doesn’t allow me to stop and smell the roses very much. If you start a company and risk it all to make it succeed, you clearly have a different perspective on life. It’s such a fierce internal drive, one that allows you to follow your dreams until they come to life, and that drive comes at the expense of leisure and free-time. Definitely – running a business is hard work but it pays off! Can you tell me about a time you’ve failed and what you learned from the experience? First of all, I fail all the time. Here’s one of the most profound: in 2002, I purchased a tanning salon. It nose-dived after I took it over. Failure #1: I was not mature enough or responsible enough to run a company and I learned that owning a successful business cannot be a hobby. You must be 100% all in or you’re wasting valuable minutes of your life. Failure #2: My lack of understanding of the demographic ultimately did me in and I lost the business. I learned you must be 1000% in-tune to your customers, their needs, and the customer service aspect of your business. Failure #3: Losing that company put me in debt $70,000 at ripe old age of 25. It took me a very, very long and painful time to pay that off so I learned to be much wiser with where money is spent. You know, it takes serious guts to be in debt for $70k at 25 and still have the desire to take a risk – good for you! What was the biggest sales hurdle you’ve had to overcome and how did you do it? Our sales have been very healthy fortunately, although properly pricing products and financials has been the biggest hurdle. Learning and really understanding all about proper product pricing, product margins, and a few other issues associated with finance has definitely been my biggest feat (with a lot more to go!). With help from the Sharks, I brought in a Harvard finance graduate to review all of our finances and learnt some key metrics and pointers in order to properly price products. No shame in asking for calling in an expert and asking for help! Lastly, what does the future look like for you? Our next and most significant goal is to fully cross over into the natural grocery chains as we feel that our products are fit for everyone to enjoy. The fitness niche we started in was simply a test/launch market which we experienced tremendous success in. But now, it’s time to share our story with the rest of the world and let them know that our all natural, health conscious, fit spreads are here to make a big impact on how we will be feeding ourselves and our children in the future. The most obvious price of being a successful entrepreneur is time. Know what you know, but more importantly, know what you don't know.